A highly important ornithologist working at the turn of the century was Coenraad Jacob Temminck [1778-1858], the son of Jacob Temminck, for whom Le Vaillant collected specimens. Coenraad Temminck was a noted collector and systematist. He was one of the earliest ornithologists to become interested in studying one bird species in detail, rather than in adding new species to his collections. His in-depth studies of pigeons contributed greatly to his reputation as an ornithologist. Coenraad Temminck's Manuel d'ornithologie, ou Tableau systematique des oiseaux qui se trouvent en Europe, issued first in 1815 and then in a four-volume enlarged edition from 1820 to 1840, remained the standard work on European avifauna for many years. A copy of the four-volume edition is part of the Cornell collections. Temminck's earliest publication was a catalog of about 1,100 species in his father's large collection, called Catalogue systematique du cabinet d'ornithologie et de la collection de quadrumanes de Crd. Jb. Temminck (1807). A copy of this title appears in the Hill Collection, as does his small work Observation sur la classification methodique des oiseaux (1817). Major monographs devoted to a single species or group of species became increasingly characteristic of the 19th century, as the growth of scientific information made it very difficult to describe all the avian world in detail in one work. Histoire naturelle et mythologique de l'ibis (1805) was an early 19th-century monograph by Jules Savigny. Two or three decades later hummingbirds were given a good deal of attention by Sir William Jardine [1800-1874] and René Primevère Lesson [1794-1849]. 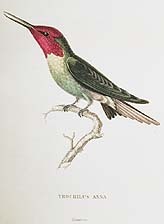 Jardine's The natural history of hummingbirds appeared initially in 1833 and continued to be included in the Ornithology volumes of his Naturalist's library. Lesson's Histoire naturelle des oiseaux-mouches was published about 1829, followed by Les trochilidées (1833) and Histoire naturelle des colibris suivi d'un supplement à l'histoire des oiseaux-mouches (1847). A different kind of bird altogether was the concern of Hugh Edwin Strickland [1811-1853], who published The dodo and its kindred (1848).